Third beta of Qowala 1.0 comes with great news! If you were missing some interactions in the previous beta, you can now get live notifications from Twitter directly in Qowala. Until now, we were one developer and one UX designer working on making Qowala live a great social network dashboard, but now two more people joined the project! Even though we are only working for Qowala during our spare time, we are trying to have regular releases every 2-3 weeks. 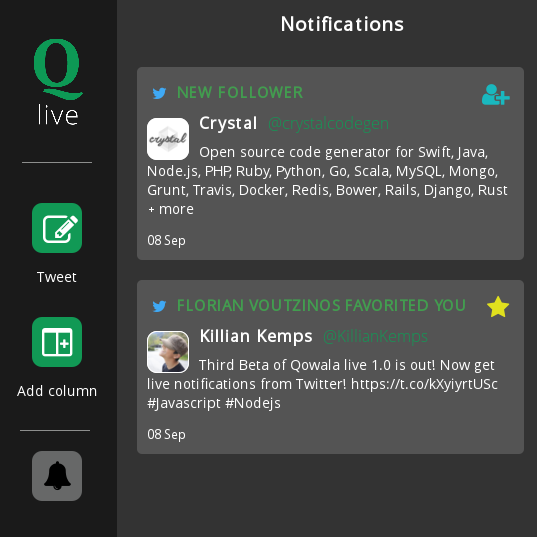 So last week, we released Qowala live 1.0.0-beta-3 which now allows to get live Twitter notifications and to be able to reply directly to tweets. This release now makes more comfortable to have live interactions with people on the social network. If you are interested, you can follow our progress directly on Taiga to get to know the next features that will be implemented and, if you wish, you can give us a help! What's next with the new team? In fact, you should not have had to ask the question as it is all indicated on Taiga . But for the purpose of the article I will explain our next objectives. For the next sprint, we are going to get a new logo and a new design for the interface so it allows you to switch between light and dark theme of the interface (between day and night). We will also add some other features like the autocompletion of Twitter's usernames that will make you really comfortable with the tool. Furthermore, you can think that we are doing quite a lot of beta versions because we can't manage to make it stable, the explanation is the following: we think that people are waiting from Qowala live to be a dashboard having at least all the features that twitter.com offers. In consequence, we want to make the true 1.0.0 version with all the needed features to be able to use Twitter without having to use its website. As it takes time to implement them all, as we want to make regular releases and as it is already working great now, we chose to mark the versions as beta. What do you think of Qowala live? You found an error in this article? Some advice? You can send a comment by email to "blog at killiankemps.fr" with "[Comment][en][Third beta of Qowala 1.0 comes with great news!]" as subject.